Luaus typically feature delicious Hawaiian foods such as poi, kalua pig, poke, lomi salmon, opihi, and haupia. 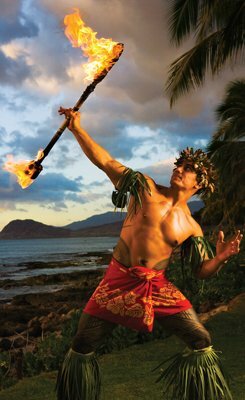 Along with delicious food, visitors can expect entertainment such as fire dancing, hula, spear throwing, lei making, and other fun interactive activities the whole family will enjoy. Luaus can range in prices depending on what package is suitable for your family. I highly recommend your family to pickup the Go Oahu Card. 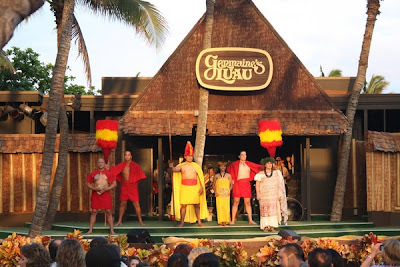 With the Oahu Go Card admission to the Polynesian Cultural Center and Germaine's Luau is included along with 38 other attractions in Oahu. The Polynesian Cultural Center is known for providing most authentic Hawaiian luau experiences on the island. In fact, a majority of their employees are from the host Polynesian Nation they represent. 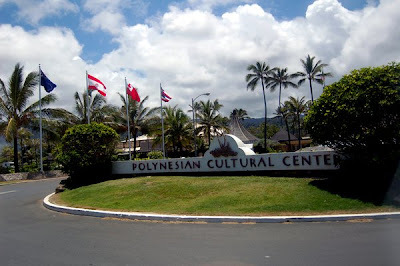 The PCC features the people and islands of Hawaii, Samoa, Aotearoa (Maori New Zealand), Fiji, the Marquesas, Tahiti, and Tonga; as well as a Rapa Nui exhibit and an 1850s-era Christian mission complex. For the kids there are special keiki-oriented Ohana Adventure activities that are planned throughout the day, including activities like Hawaiian hula lessons, Tongan shuffleboard, and Tahitian fishing. Kids can even get a parent-approved Marquesas cultural tattoo. Parents can try their hand at spear throwing, fire walking, tiki carving, fire knife dancing, and coconut husking. After the sun sets and the family has feasted on delicious Hawaiian food, there is an unforgettable show called Ha Breath of Life. The show is spectacle of over a hundred performers from across the Pacific, drums, dance, special effects, a fire spewing volcano and an amazing fire knife performance. The PCC is located on the North Shore and takes about 1 hour to get to from Waikiki. If you have a rental car , the address is 55-370 Kamehameha Hwy Laie, HI 96762. I recommend your family make it an all day event, because there are over 42 acres of informative history, activities, and culture to learn about. For Polynesian Cultural Center Packages - CLICK HERE! The Paradise Cove Luau is located on a beautiful private beach in Kapolei. Activities at the PC include: coconut tree climbing , hula lessons, lei making, personnel canoe rides in the cove, and spear throwing. Like all the other luaus the food is served buffet style with all the traditional Hawaiian offerings such as Kalua pig cooked with banana leaves buried in the sand. The show has all the elements of Polynesian and Hawaiian culture with a culminating Samoan fire dance. About halfway through the show, the performers passed out grass skirts to teach participants how to hula. Don't be shy and make sure your family joins in on the fun. Germaine's Luau is also located on a private beach in Kapolei. When we first drove out there, we thought we were lost because it is out in the middle of nowhere in an industrial area. Nevertheless, the beach and site of this Luau was very beautiful. Unlike the other luaus there are no activities for entertainment in between the luau buffet and the show. Where Germaine's really shines is getting the crowd involved in the show. There are plenty of opportunities for the whole family to dance and have a great time trying their hand at hula. While Germaine's is a little cheesy, we found it difficult not to smile and have a great time. Come with an appetite, willingness to participate in the fun, and bring bug repellent! Tickets and reservations can be made on their website.